Dimplex TTRC130 80W Water Glycol Filled Electric Towel Rail Chrome - John Cribb & Sons Ltd, UK Electrical Distributors, Dorset, Hampshire, Wiltshire, Somerset & the Isle of Wight. Tubular steel, water glycol filled, left or right hand cable entry, IPX5 rated. What a difference warm, dry towels make! With a Dimplex towel rail you can have them all the time but at amazingly low running costs. What a difference warm, dry towels make! With a Dimplex towel rail you can have them all the time but at amazingly low running costs. 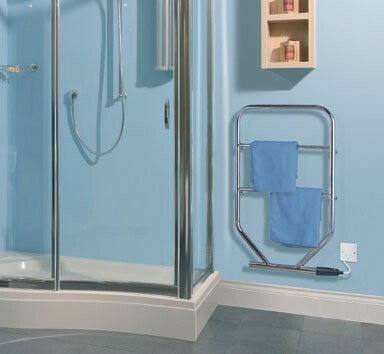 TTR range towel rails are permanently liquid filled for maintenance free operation. They can be mounted for left or right hand cable entry. No plumbing. No problems. And they can be left switched on indefinitely. A range of five models. Choice of sizes and finishes. Larger models will help to take the chill off a small bathroom or cloakroom. Splash-proof (IPX5 rated) for use in bathrooms and other wet areas. Supplied with wall mounting brackets as standard. All models – left or right hand. White stove enamel or chrome plated. As a plated finish radiates less heat away from its surface, the plated models have a lower loading compared with the equivalent physical size stove enamel model, so that both have a similar surface temperature. Supply cable is provided for connection to the fixed wiring of the premises via a suitable double pole isolating switch. Installation must be carried out strictly in accordance with the current edition of the IEE wiring regulations. If the towel rail is fitted in a bathroom essentially these regulations preclude the use of a plug and socket and any control switch must be normally inaccessible to a person using a fixed bath or shower. The pull cord of a cord-operated switch is not affected by this regulation.